However you look at it canting or tilting a firearm causes errors in accuracy. (See our articles on canting.) 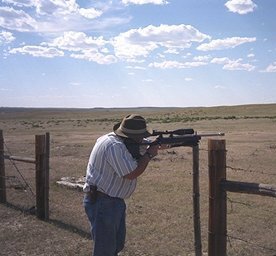 Canting or tilting of the firearm happens inadvertently when the shooter rotates the firearm around the central axis of the scope. Some shooters believe that they have a great inner sense of what is true vertical and that they don’t need a mechanical device to make those long shots. Well I thought so too, until I started some investigations into the subject. On a recent trip to the Ford Museum in Dearborn MI, I was amazed to see that circa 1900 Blackpowder Creedmore target rifles had bubble levels fitted in the front sights. This makes sense when you consider that these rifles were used for long range shooting. With large, heavy projectiles and their slow relative velocity, huge amounts of elevation compensation were needed to assure that the bullet would hit the target. Just by looking at that rear tang peep sight with about an inch and a half of elevation adjustment, it is clear that cant was an important factor with the shooters of that era. Upon further research including reading articles in the Varmint Hunter and various other publications, the results I was experiencing were validated. I concluded that cant does affect the point of impact, but by how much? The answer is not a simple one. If you have a very flat shooting projectile at short distances (and if your sights are aligned in this flat region) you may not be able to perceive much cant error. However, if you shoot long ranges at miniscule targets or shoot with a loopy trajectory as with airguns, blackpowder, or at extreme distances (400 to 1500 yards) you will be able to experience the problem yourself. Bow hunters, for instance, are keenly aware of cant error, since they need to adjust the elevation of the bow for long shots. During a competitive airgun shooting, I found it impossible to use the two eyed, double vision bubble level setups that are prominently advertised in the shooting publications. I found it extremely distracting, if not impossible, to try to concentrate on the bubble level and the target at the same time. Furthermore, the simple 2D geometry explanations that are currently being published do not fully explain all the error that I was experiencing. As I tried to understand the problem, I became aware that the difficulty was a compounding of errors that makes it easy to misunderstand the real problem at hand. I now have an understanding of how the tilt creates these accuracy errors and have found an easier way to help eliminate them (see Cant Errors). The problem became more apparent when participating in long-range varmint hunting. Varmint hunters today are so spoiled with their screaming fast, light weight projectiles. For the most part, they shoot relatively flat and, therefore, require very little elevation compensation out to about 300 yards. With the sport being what it is, we are always trying to push the envelope. Those of us that extend the range to 500 plus yards will see the effects of canting come into play. Thus, my quest began to develop a superior cant detecting device for shooters to eliminate the effects of canting on long-range shots. After experimenting with many types of products and sensors, it became clear that the issue is not really a problem with the sensing mechanism at all. Rather the real issue is how the human brain interacts with the output information from the device. The various different products that show bubble levels mounted externally to the scope require that one eye or the other constantly re-focus between the distant target and the close bubble level, which visually results in some cross eyed double vision in your sight picture. Use of an external device requires the shooter to focus on the device and the target simultaneously. One scope manufacturer has a bubble level inside the scope. This still requires the shooter to look at and decide when it is centered. The last thing a shooter needs is something else to break his focus or concentration. It quickly became apparent that we needed to get information to the shooter in some sort of a subconscious way. Yes, we thought about electric shock therapy but we couldn’t find a place for the large battery. More realistically, we concluded that using peripheral vision would be a better place to start. Our brains are wired to continuously take in information from our peripheral vision without affecting our primary concentration or central vision. Think of it like driving a car. We are constantly watching the road with our central vision. If a car approaches from the side or movement appears in the rear view mirror, we are aware that something is coming although we may not always know exactly what it is. As it turns out, our brains are especially adapted to accept information in our peripheral vision while still letting one concentrate on the central vision. (Really, I am not making this up – I went to the library to find this out!) After having gained this knowledge, the Microlevel® was developed to work accordingly. As with any type of anti-cant device, there needs to be some sort of output to indicate the degree and direction to which you are “out-of-true vertical”. Likewise, a shooter needs to know when he is “dead-on-true vertical” requiring no correction. To indicate gross “out-of-true vertical,” we incorporated two red LEDs that are positioned symmetrically about a center green LED. Two yellow LEDs, also positioned symmetrically, indicate a lesser degree of “out-of-true vertical.” The green LED is situated in the center of the display and is illuminated when the firearm is “dead-on-true vertical.” It is not necessary to focus on the LEDs as you sense through your peripheral vision the color and the side on which the LEDs are illuminated (if other than green). The shooter then can rotate the firearm toward the central green LED, all the while focusing on the desired target. When the green LED is illuminated and the target is in sight you are good to go. One problem with our peripheral vision is that we cannot make out fine details. We can see large changes in shape and movement and some color. The Microlevel® was designed with five very distinct indicators. The central indicator is green, and shows when the firearm is within a prescribed range of true vertical- say plus or minus 1 degree, as long as you are within the ‘zone’ the LED stays on (good-to-go). When you exceed the zone limit the yellow light comes on and the green light goes out. Likewise with the red indicator. The indicators are housed in a soft rubber eyecup close to the eye. The eyecup slides onto the ocular side of the scope but does not obstruct the full view of the scope image. By using peripheral vision, the shooter senses the color, adjusts if necessary, holds and shoots. With this, the shooter has achieved his goal of keeping his concentration on the scope reticle. It’s kind of hard to believe all of the ways there are to determine when something is true vertical. This had me derailed for a long time. Systems like mercury switches, pendulums, etc. are simple to build but make for extremely twitchy, distracting signals. Making this type of signal meaningful to the shooter is a difficult task. What we needed was a way to damp the signal, slowing down the flow of information to the LED indicators. It also became clear that different shooting disciplines needed different degrees of resolution. By that, we mean that someone shooting 1000-yard bench rest will need to be true vertical within plus or minus 1 degree. On the other hand, this fine resolution would be too difficult to hold in a field position such as sitting. Furthermore, holding a firearm offhand requires a much larger zone of error. All these requirements made it seem like we would never find a useable solution. David, a long-time friend and a Cracker Jack electrical engineer as well as a wizard circuit designer proved to be quite an asset in assisting with the resolution of this issue. David and I have been known to dispatch our fair share of dirt pigs and pasture poodles. The long drives to and from various shooting events provided us with time to conjure up wacky new product ideas for our favorite sport. David has been working with me to evaluate various different electric level sensors for this project. In two years of development, we were unsuccessful at making any one idea work the way we had envisioned. After we had exhausted most of my crazy ideas, David came up with an idea for using the brand new chip that senses gravity. These chips are used in things like automotive airbag sensors and flight stabilization computers. We tested a sample with a computer hookup and found it was able to detect cant with great sensitivity. The downside was that it needed a microprocessor to make sense of the complicated math output functions. 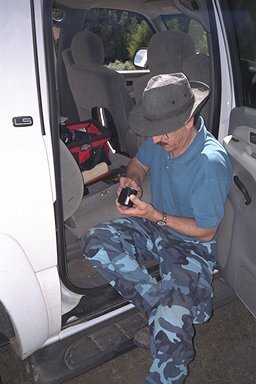 David went to work defining component specifications, circuit diagrams, and he looked for a mini computer chip that could handle the math. From an old rubber eyecup, we built up a working prototype. He found a small microprocessor, which took the output signals from the sensor and used programmed logic to drive the LED indicators. It worked, but again the signal was still too twitchy. We knew with the microprocessor, we could massage the math, but it was it was time to find a real programmer to fine-tune the program. We contacted another friend, Bill, who had in interest in shooting and could understand the problem we were trying to address. Bill brought the last pieces together being able to squeeze the microprocessor into submission. Through various different math functions, Bill was able to damp the output signal so that the shooter was not constantly barraged with blinky lights. The damping slowed down the signal, which gives the shooter enough time to make slight corrections and also ignores small transient imperfections in the hold pattern, like heartbeat. While all very complicated inside the box, it means the device is very uncomplicated to use. In addition, Bill was able to program the microprocessor to allow us to reset the Zero point into memory, (handy for quick setup when installing the unit), to change the true vertical of brightness of the LEDs and to choose between three different resolution modes. We then made a handful of prototypes with real circuit boards and computer programming and outfitted five shooters with the first Long-Shot Microlevels last spring on our annual prairie dog hunt in Wyoming. We strapped them on various scopes and different caliber firearms. I used one in airgun competition last year and had my best year ever finishing 4th in the national competitions. We sent out prototypes to friends to get their feedback and all seemed to agree that we have solved the problem and maintained ease of use. Moreover, we were all amazed at how often our first setup on bipods was completely out of true vertical. We all came away with two convictions. The first was that with rolling hills on the horizon it is difficult, if not impossible, to hold your firearm without cant error especially in the heat of battle. The second conviction was that a true vertical firearm makes a huge difference in your hit rate at long-ranges. Furthermore, the concept of peripheral vision sensing works extremely well. It takes about half an hour to feel comfortable with the colored light in your peripheral vision but once you get the hang of it, it becomes second nature. From there we’ve had to focus on a housing design that would accommodate various scope sizes and be removable so it could be moved from one scope to another. It had to be rugged enough to survive the recoil of heavy caliber rifles, yet small enough to work with most any gun. Craig, who works at Long-Shot Products Ltd., did all of the CAD work: designing the housing, packing in all the circuit boards, switches and batteries into a nice compact housing. 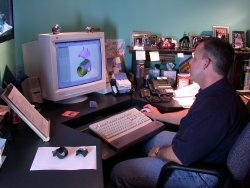 He just happens to be a 3D solid modeling expert. To be able to properly design the product Craig said, “I must use it.” He claims he needed to iron out the details in the field. Craig had his opportunity while attending the prototype evaluation in Wyoming. He has effectively worked out all of the tooling problems and is gearing up the first production runs. The whole team at Long-Shot hopes you have as much satisfaction with our product as we have had making a no-compromise precision tool. Stay tuned for other products as we weave through our first year of production with an idea started by shooters for shooters. Always check local regulations and remember to obtain permission before hunting on private property.